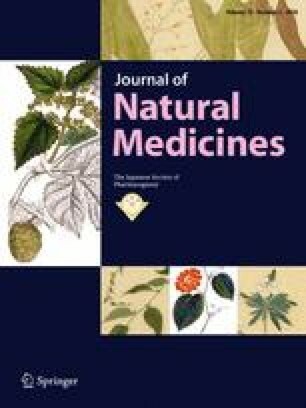 A methanol extract of mace, the aril of Myristica fragrans (Myristicaceae), was found to inhibit the release of β-hexosaminidase, a marker of antigen-IgE-stimulated degranulation in rat basophilic leukemia cells (RBL-2H3, IC50 = 45.7 μg/ml). From the extract, three new 8-O-4′ type neolignans, maceneolignans I–K (1–3), were isolated, and the stereostructures of 1–3 were elucidated based on spectroscopic and chemical evidence. Among the isolates, maceneolignans A (5), D (6), and H (8), (−)-(8R)-∆8′-4-hydroxy-3,3′,5′-trimethoxy-8-O-4′-neolignan (13), (−)-(8R)-∆8′-3,4,5,3′,5′-pentamethoxy-8-O-4′-neolignan (14), (−)-erythro-(7R,8S)-∆8′-7-acetoxy-3,4-methylenedioxy-3′,5′-dimethoxy-8-O-4′-neolignan (17), (+)-licarin A (20), nectandrin B (24), verrucosin (25), and malabaricone C (29) were investigated as possible degranulation inhibitors (IC50 = 20.7–63.7 μM). These inhibitory activities were more potent than those of the antiallergic agents tranilast (282 μM) and ketotifen fumalate (158 μM). Compounds 5, 25, and 29 also inhibited antigen-stimulated tumor necrosis factor-α production (IC50 = 39.5–51.2 μM), an important process in the late phase of type I allergic reactions. The online version of this article ( https://doi.org/10.1007/s11418-017-1170-x) contains supplementary material, which is available to authorized users. This work was supported by the MEXT-Supported Program for the Strategic Research Foundation at Private Universities, 2014–2018, Japan (S1411037, T. M.), as well as the JSPS KAKENHI, Japan, grant nos. 15K08008 (T. M.), 15K08009 (K. N.), and 16K08313 (O. M.).